Meiner Flats as it looks today, stabilized. But there’s more to this story. In early 2008, Meiner Flats was on the precipice of demolition. Danny Klinger, now of OTR A.D.O.P.T, started a campaign to save the Meiner Flats via PledgeBank. Thanks to Danny’s efforts and the campaign he started, Meiner Flats was saved and stabilized by the city of Cincinnati and 3CDC. Soon, Meiner Flats will be rehabilitated by 3CDC. The saga was even highlighted by Preservation Magazine. 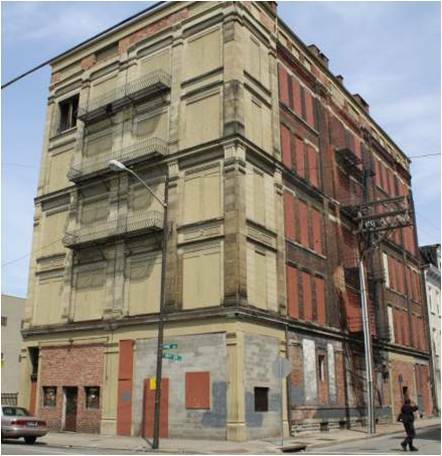 Building Cincinnati‘s reports about the Meiners building from 2008 can be viewed here. Thank you for clarifying the WHOLE story. If it wasn’t for Danny’s efforts and the $4000.00 he raised (donations by many, including me), the city would have demoed this building without blinking. Although the city never used the money, it was demonstration that the public did not want this beautiful building razed. Glad to see it will be a showplace in this future developement. I hope someone in the media recounts this story at some point. Thanks for donating to the effort, Brian. Pat, thanks for sharing! Do you have any photos of OTR from that time?